Three wheel baby strollers are becoming more and more common, and not just the jogging variety. What is known in the stroller industry as all-terrain models are being produced by just about every major manufacturer. They are often bigger, with a larger distance between the back wheels that creates a really stable base. But their single front wheel makes maneuvering much easier. The overall design of the top rated 3-wheel baby strollers makes them well suited for off-road excursions as well as uneven sidewalks. Most 3-wheel baby strollers have soft, air-filled tires that provide a comfortable ride for your passenger on a variety of surfaces and also make stroller much easier to push. The Mountain Buggy Urban Single Jogging Stroller is the best 3-wheeled baby stroller that you can buy today. With its well-designed rubber wheels and shock absorbers, it renders constantly smooth rides for your infant, even along the extremely rugged and bumpy street. The all-terrain wheels allow you to talk baby for walks on the beach or snow-covered pavements. Besides, this top-notch baby stroller has a unique front wheel, which can be fixed or set to swivel by option. With this feature, you can turn the baby stroller on a dime and maneuver it at ease with only one hand. With its ability to recline into various positions, it is suitable for babies from newborn to 4 years old. Apart from that, Mountain Buggy Urban Single Jogging Stroller can be used with infant car seats. The infant car seat can be directly locked into the carriage frame. Baby need not be disturbed in the transition process from car to baby stroller. Furthermore, it is easy to fold up for storage, even with only one hand. Mountain Buggy Urban Single Jogging Stroller is equipped with a spacious bag under the stroller where you can keep some essential items. You can also buy a cup holder to clip to the handlebar. 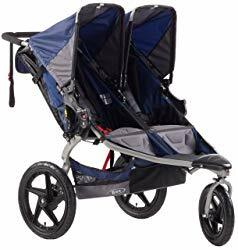 As aforementioned, Mountain Buggy Urban Single Jogging Stroller is a pricey high-end product, which is sleek in design, unique, versatile, comfortable and safe. It is a baby stroller that offers ultimate comfort for the infant while rendering invaluable convenience for the parents. Although there are numerous types of baby strollers in the market, to get a desirable one at an affordable price is pretty hard more often than not. This is especially true when you are searching for a single baby stroller that can accommodate both your newborn and toddler at the same time, which means a baby stroller with double seats. Phil & Ted Red Sports Buggy with Doubles Kit is a cost-effective 3 wheel baby stroller, which is capable of converting into a double-seat baby stroller with the help of the double kit that is selling separately. This particular baby stroller is suitable for newborn to 4-year-old toddler. With the use of double kit, you can fit this versatile baby stroller with a newborn and a toddler or two toddlers at one time. It offers absolute comfort to your child, especially newborn with its spacious seat that fabricated with Velcro adjustable crotch strap and sun visor (canopy) with a window as well as capable of full reclining. Apart from that, Phil & Ted Red Sports Buggy with Doubles Kit is modern in design, vibrant in colors and has good quality fabric. It also has ratcheting adjustable handlebar with a wrist strap that is extendable for tall people. Hence, undesired slouching or stooping can be avoided. This baby stroller has a lockable front wheel and single-action dual rear brake that are particularly useful in ensuring the safety of the infant and offering smooth rides, even along craggy streets or pavements. A fender is installed at the rear wheels to prevent the splashing up of mud and soil on rainy days. For the purpose of better storage, the wheels of Phil & Ted Red Sports Buggy with Doubles Kit are designed to be removable by a push-button. Thus, it can be flatly folded and the space needed in the trunk is greatly reduced. Besides, there is a roomy basket under the stroller for keeping baby’s essential stuff as well as a pocket on the canopy for keeping smaller stuff such as keys. As an extra benefit, this baby stroller enables you to jog with two kids without hassles. To sum up, Phil & Ted Red Sports Buggy with Doubles Kit offers great functions with a reasonable price, and renders improved maneuverability with good control! The Revolution SE has been created with the latest and most innovative features required for a good 3-wheeled stroller. It offers excellent performance even in sporting and difficult conditions. Parents will have no problem in taking their child with them even if there happen to be tight corners on the way. The front wheel of the stroller can swivel for easy turns, but it can be locked to increase the stability. The design ensures that it can be folded easily for storage. Moreover, it is light enough for easy movements. The suspension system is excellent ensuring maximum comfort for the baby even when traveling over difficult terrains such as gravel and dirt. The usability of the Revolution SE can be enhanced with extra features such as an adapter to attach it to a car seat. A snack tray can also be attached to keep food and drinks for an older child. The seat can be reclined if the baby wants to enjoy a nap. A multi-position canopy is available which can be adjusted for better shade. Minimal effort is required to assemble the stroller for use. Safety for the child is ensured with a five-point harness that has been padded for comfort. This jogging stroller from Graco is one of the best crossover strollers in the market today. The construction of the stroller allows it to provide the same level of comfort of a traditional stroller. At the same time, it is extremely maneuverable with a high level of performance which suits its classification as a jogger type of stroller. The proprietary FastAction folding technology of Graco has been implemented in this stroller. Parents will find it easier to fold the stroller thanks to this technology. There are multiple positions for reclining the seats to ensure a better level of comfort for the baby. Special attachments are available for making the stroller more useful for the baby and the parents. The storage basket is an extra-large one to help carry all various items required by the baby. There is even a specialized holder for smartphones for the parents. The folding system is a breeze. All that is required to fold or unfold the stroller is one quick movement. Portability is not an issue. The air-filled tires are made of rubber which ensures a smoother ride for the baby on any terrain. The plush padding enhances the comfort of the cushions and gives more support to the baby, especially during more strenuous activities such as runs and jogs. Safety for the baby has also been ensured, thanks to the harness system which can have either 3 or 5 points. A sporty experience is offered by this stroller from Graco. It has been designed with the special folding mechanism developed by the manufacturer. You can fold or unfold the stroller using a single hand if you want. The entire process is extremely quick as well. Moreover, there is also a carrying strap in the jogger to make it easier for you to move around when folded. The portability of this jogger is enhanced due to the lightweight nature of the frame. However, the low weight does not affect the strength or the sturdiness of the frame in any way whatsoever. It can fulfill its duties as a jogger effectively. It takes only a single step to get the stroller attached to the baby seat as long as it is a Graco model. The stroller can carry a child weighing up to 50 pounds without any problems whatsoever. Multiple positions are available for the seat to be reclined in. This ensures that you can give as much comfort as required by your child. The canopy can be extended to give more shade against the elements. The price is also a major plus point for this stroller. The Revolution SE Duallie from BOB was created to help parents with two kids. After all, it is difficult to carry around two separate strollers at the same time. In spite of the dual carriage system of the stroller, the functionality or the strength of the stroller remains intact. The front wheel can be swiveled allowing you to have greater control over the stroller when taking tight turns. The suspension system is one of the best in the market. At the same time, the wheels have air tires which add to the overall comfort provided by the stroller to the baby. The seats can be reclined whenever required. The canopies can be adjusted to multiple positions. While they are wide enough to offer enough protection, windows have been provided so that you can look at your children whenever you want. Minimal effort is required to assemble the stroller for use. The frame is light enough for easing transportation and storage. The fabric is durable and can be washed easily. It is also stain resistant which is perfect for a jogging stroller. The harness system is a five-point-one which keeps the babies safe even in the most difficult scenarios. The safety is enhanced by the presence of fasteners on the harness. Even more, safety is ensured by a brake system in the rear wheels which can be activated quickly during emergencies. The stability, ease of steering, and comfort are appreciated even by those parents who don’t need a serious jogging stroller. These all-terrain strollers may look like joggers but you should check the user’s manual to see if it is advisable to actually use it for running with your baby. You should also check on the age requirements because most are not recommended for babies under six months old. Generally, pediatricians recommend that a baby can support its neck and sit up independently before using this type of stroller. There are exceptions to this guideline: the Maclaren MX3 is one of them. On the plus side, some all-terrain strollers can accommodate heavier children than standard strollers, allowing you to use them for a longer duration. Some disadvantages of 3-wheeled all-terrain models are that they are often large and heavy, making them an impractical choice for traveling. Another downer is that the air-filled tires can go flat so you’ll need a bicycle pump. But if you’re the rugged outdoorsy type that is drawn to this type of stroller, you probably have a bike pump already. Most of the best 3-wheel baby strollers range in price from $80 to more than $700. Choosing a good 3-wheel baby stroller for your precious one is by no means an easy task. After all, there are so many different kinds of strollers available. Additionally, there are other considerations to take care of before you can proceed with the purchase. It is important to understand the different aspects of the stroller to ensure that the best decision is taken. The Budget: It is important to determine the budget that you can spend on a new stroller. Most parents tend to choose the cheapest option available. However, if you are looking for a good and high quality buggy, you will have to spend some time. Determining the budget will help narrow down the choices available making it easier to select the best item for your money. The safety features: It is important to ensure that the stroller is safe for your baby. It becomes all the more crucial if you are planning to buy an active type of buggy such as a jogging stroller. Most strollers come equipped with harnesses or at least a seatbelt. 5 point harnesses are the best option. Moreover, harnesses and belts should be padded to ensure comfort. Other safety features can be present on the buggy. Additional features: Nowadays, manufacturers implement a variety of features in their strollers. You may find them to be of use. Therefore, check the stroller out to see if it provides the features you need. You may want a tray for keeping food and drinks for your baby or a cup holder for your coffee. Extra baggage space may be required for carrying the various baby items such as napkins and towels. Ease of use: The stroller should be easy to use by you. It should not be too difficult to fold or take up too much space after being folded. It should be light enough to push around and pick up. If it has an adjustable car seat option, the feature should be easily operable. You should not find the buggy to be difficult to push or maneuver. A jogging stroller should have a locking mechanism that is strong and yet easy to operate. You can test out these features before the purchase so that they do not end up being a problem later. As a parent, you will want your child to be safe and comfortable when you are out on a journey with your family. A careful consideration of the features and functionalities will ensure that your baby enjoys the trip as much as you do, especially when you have opted for a jogging stroller. Carefully go through the reviews as well. This ensures your satisfaction as well as the happiness of your baby. A stroller can be considered to be an investment. With a high quality stroller, you will be sizeable returns on your investment in the form of comfort and peace of mind. A good stroller can last for many years. It can see your newborn baby become a toddler. If you choose an especially good stroller, you may find that your grandchildren will also end up using it. These strollers are the most popular strollers among the parents. My husband also bought it for our baby who is 9 months old. But you have to use it if your baby is higher than six months. The advantage of this stroller is it is very lightweight, stylish and easy to fold. If you want to bye follow the article for more knowledge. Really this is awesome strollers which you have given. When our newborn baby day by day growing up a stroller must be needed for them. But sometime we cannot choose the best stroller. When we buy best stroller we have to look it’s good feature and advantage of the stroller.